AOS is a liquids terminal service company that provides safe and efficient storage, handling and shipment of bulk liquid products for customers in the petroleum industry. 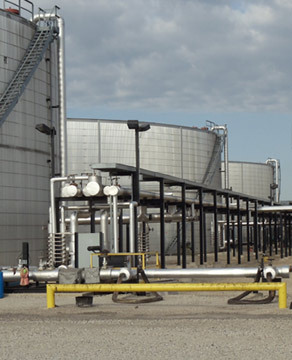 To provide storage, production and terminal services to the petroleum industry in an efficient and effective manner that provides the greatest value to the customer, utilizing internal and external knowledge, skills, and resources. We feel that health, safety & environmental compliance are our top priority and are the necessary foundations needed for long term performance and sustainability. We build this foundation by first ensuring compliance with regulatory agencies, building and utilizing tools that keep us in compliance, and ensuring employees have the needed knowledge and tools necessary to perform their duties in a proactive and professional manner. Our philosophy is simple, if we have a good foundation (HSE Culture) and the nuts and bolts are tight (Programs, Processes, and Commitment) we will continue to grow and sustain our business to achieve long term gains versus short term profitability.